Black Soldier Fly adult Larvae in coffee grounds. Identification: Adult flies look like wasps and are bare of bristles. They are not strong fliers. Antennae have three segments, often carried in the form of a V. Colors range from dark metallic blue-black to brightly banded with yellow and pale green. Wings are large and lie over each other. Their legs are black and white. Unlike the beneficial syrphid or hover flies, they do not hover. Larvae are tough worms with small heads and pointed ends. Culture: Eggs are laid in decaying organic matter, wood, mud and dung. 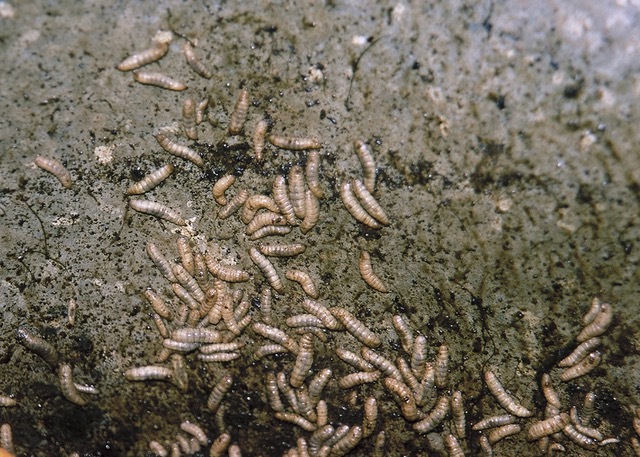 Larvae are maggot-like scavengers or predators and especially like decaying material that is on the wet side. They are thick-skinned and somewhat flattened. Pupation occurs in the last larval skin as the larvae go into their “wandering” mode. Adults are dark, sometimes banded flies. All life forms are found in the same habitat. Larvae feed on decomposing matter, including kitchen scraps and pet waste that should not go into a compost bin. Economic importance: Help with the breakdown of organic matter, especially manure s and dung. People raising earthworms find the manure-feeding larvae to be very helpful. The adults are excellent pollinators for the garden and landscape. They also help rid gardens and farms of houseflies and other pest flies. The larvae (maggots) are an excellent food source for pigs, ducks, fish, chickens, guineas and other birds. 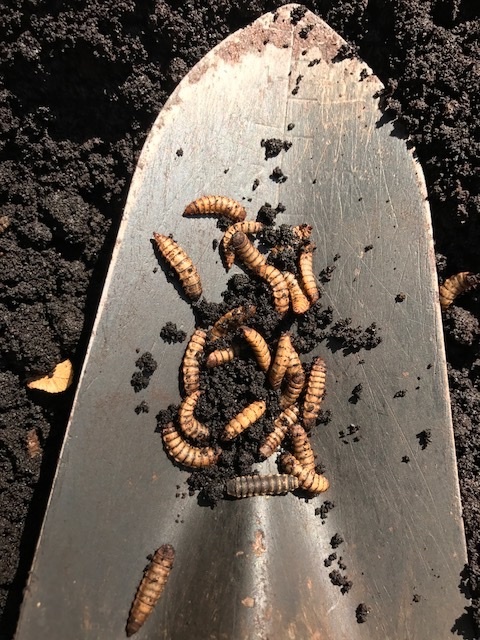 Insight: Gardeners are sometimes concerned when they buy earthworm castings or other organic fertilizers and find these maggot-like worms. No reason for concern - they hurt nothing and are quite beneficial. 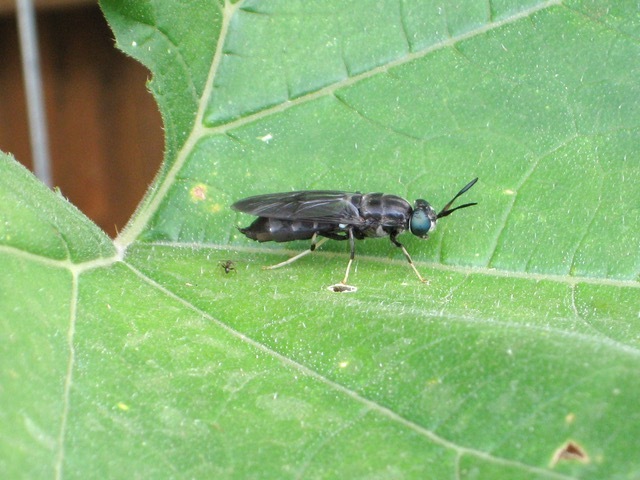 Although more rare, there is a yellow soldier fly that is equally beneficial. 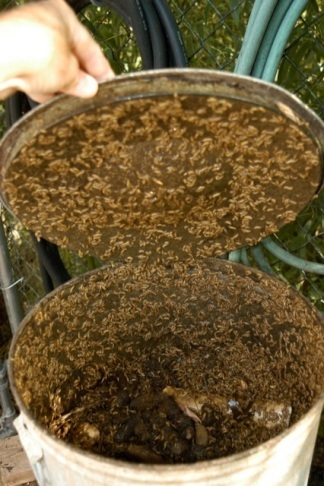 DipTerra LLC, a firm based in Lake Oswego, OR, sells black soldier fly larvae for recycling organic waste. 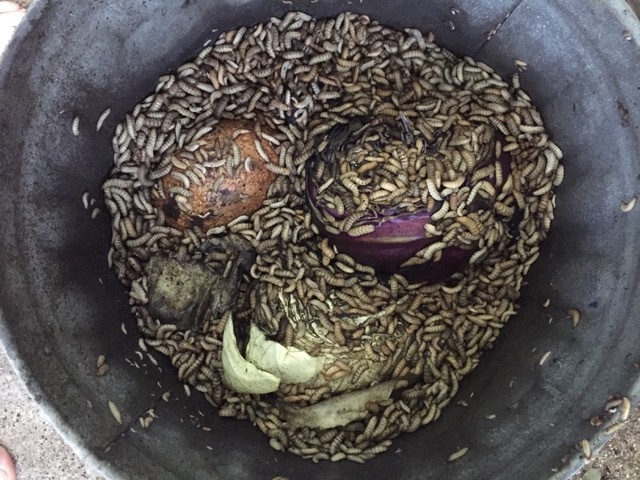 The firm’s head, Dr. Terry Green, claims that homeowners can easily use the larvae to degrade organic waste such as food scraps. Here’s the bad news. At present the FDA does not believe the use of insect protein ingredients can meet the standard for being GRAS (Generally Recognized as Safe). As a result, such ingredients would appear to require food additive approval to be legally used as an ingredient in animal food. At this time, no food additive approvals have been issued for use of any type of insect material as an ingredient for any purpose in animal foods. The European Union has similar restrictions. Maybe we can help change this.